Harry Potter And The Philosopher's Stone Live! In this age of video on demand, it can be all too easy to forget that, at its best, cinema is a community experience. A packed screening full of (code compliant) film fans can make all the difference to your enjoyment of a movie. One of the best places to experience this is London's Royal Albert Hall. I have been lucky enough to see several classic films in this venue - including Jurassic Park, Raiders Of The Lost Ark and, most recently, Harry Potter And The Philosopher's Stone. These films were all accompanied by a live orchestra - making the event even more magical. 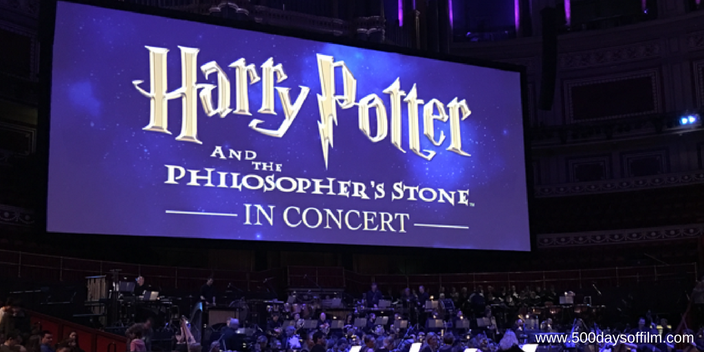 The Harry Potter screening was accompanied by the Royal Philharmonic Concert Orchestra, conducted by Justin Freer. Freer started things off with a controversial statement. He urged his audience (comprising an impressive 5000 people - making this venue Europe's largest cinema) to get involved in the movie - to cheer, to hiss and to break the hallowed cinema code of conduct. While my audience remained respectful, Freer's instruction added to the screening's wonderful atmosphere. We cheered as the sorting hat placed Harry in Gryffindor House, hissed at Slytherin, laughed at Ron's brilliant one-liners and chuckled at Hermione's snarky comments. We also showed respectful appreciation for the actors who have sadly now passed away. It was a truly special cinema experience. Sure, the tickets didn’t come cheap (I paid £58 for mine) but, there in the glorious main auditorium, it felt worth every single penny. To be honest, if I had the chance (and the budget) I would attend every single one of Royal Albert Hall’s film screenings. When you attend a movie event at the Royal Albert Hall, you feel a part of the venue's history. This is no cold, corporate multiplex experience. The Hall’s first ever film screening, a film called Our Navy, 1805-1905, took place on 21st October 1905 in honour of the centenary of the Battle Of Trafalgar. Many films were screened thereafter including Fritz Lang’s Die Niebelungen. However, the rise of the multiplex during the 1930s-1990s saw a fall in the number of movie screenings at the Royal Albert Hall. Thankfully, that all changed in 1996 when Disney hired the Hall for its European premiere of 101 Dalmations. This sparked a number of exciting and high profile film premieres, including several Bond films and James Cameron’s Titanic 3D. Royal Albert Hall relaunched its programme of screening films accompanied by live orchestras in 2009 with The Lord Of The Rings Fellowship Of The Ring. The venue hasn't looked back since. Past events include Interstellar Live, Aliens Live, Amadeus Live, Independence Day Live, Gladiator Live, Frozen In Concert and The Godfather Live. Of course, it is not just the size of the venue that creates the magical atmosphere. The live orchestra (and choir in the case of Harry Potter And The Philosopher's Stone) make these events feel extra special. appreciation for the orchestra’s amazing work. These cinema events are always worth a standing ovation. Are you tempted to snap up some tickets to one of Royal Albert Hall's live film screenings? What film would you like to see at Europe's biggest cinema? Or have you already been to one of these cinematic events? If so, what did you see?